The nation hasn't taken note of the shifting of Lieutenant General Kapil Vij from his command of 2 Corps as seriously as the case deserves. Punishing commanders is demoralising for the rank and file and creates an atmosphere of insecurity, just the thing that must be avoided in times of a warlike situation such as this. 2 Corps is a strike force that includes an armoured division, which is capable of intruding deep into enemy territory. The nation has a right to know the circumstances in which such an officer, who held a critical appointment, has been removed from his command, that too at a critical juncture. Was he removed by the government or on the orders of his superior, the army commander? What was the cause? Was it the proactive deployment of the troops under his command against the advice/approval of his superior officers? Or a punitive measure for the high casualties suffered by his troops due to accidents during the deployment stage and the fire that gutted scores of vehicles full of ammunition in a convoy in Rajasthan? At the outset, it must be mentioned that the nation requires a dashing commander at the head of a strike corps in times of war, not a copybook general or a 'yes man'. When you get dashing commanders, they are bound to come out with strong opinions and persist with them. Yet there is always a way to convince them that 'discretion is the better part of the valour', should diplomacy and tact so demand as per the higher directions. They are not beyond reason. Also, being soldiers first and foremost, they are obedient. But should removal become necessary, there are more civilised ways of doing it. The fundamental conditioning of the Indian mind being of defensive nature, we lack aggression in general. Naturally, defence services officers are no exceptions to this trait. After all they are brought up in the same ideology from childhood, though, after joining the services, tremendous efforts are made to instil aggression and dash in them. The results are mixed. Most officers continue in the defensive set of mind. That is why we never used the Indian Air Force to annihilate the Chinese People's Liberation Army in 1962 or attacked them using 'hook' tactics when they descended in the Tenga valley right down to the foothills, at heights where it was possible for the Indian Army to fight them. The air force could have literally massacred the Chinese and the army units using 'hook' tactics could have played hell into them, but that was not to be. Similarly, in 1965 as well as in 1971, we let opportunities to liberate Pakistan-occupied Kashmir slip us by. No doubt, the defensive mindset of our political leaders and their diplomatic as well as bureaucratic advisers mattered more, but responsible senior defence services officers cannot escape unscathed either. Nevertheless, there are dashing officers in the mould of General Sagat Singh, who in 1971 made a spectacular victory possible in Bangladesh in just 12 days. That is the kind of material required to lead a strike corps and as per the newspaper reports, General Vij possessed it. The same can't be said of everyone and it may yet prove to be disastrous to have removed a proven dashing commander. As for the casualties suffered while laying mines and the other accidents, the blame can't be apportioned to the corps commander. As I recollect, in 1971 too we made mistakes during the exercises prior to war. No doubt rusting of basic skills mustn't be permitted by battle-worthy troops, but it happens. The blame for such mishaps lies with the responsible individuals and the lower commanders, not the general himself, unless most of the units display a similar pattern indicating a general lack of training and lax discipline for which the top man can then be indicted. 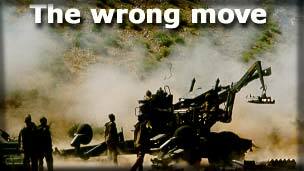 Coming to the fires that have gutted ammunition worth thousands of millions of rupees ever since the Kargil war in 1999, it is a disgrace, to say the least. The army in general and the Ordnance Corps in particular must pull up their socks. The pattern also indicates that apart from negligence, the saboteurs may have observed some weak link in our internal security measures in guarding and transporting ammunition and supplies, of which they are taking advantage. Starving the army of its ammunition is certainly a better tactic than killing some soldiers. It is to be hoped that all concerned have learned their lessons by now and have taken necessary corrective actions. That is not to say that the errant should be allowed to go unpunished; far from it. But the general himself, however, can hardly be held responsible for such negligence on the part of some very junior officer and jawans. It will be too far-fetched to call it a command failure. In the absence of authentic information, this incident can only be termed an overreaction and condemned.